[by You-bin Ha] JTBC ‘Where Is My Friend’s Home In Nepal’ unveiled the posters by showing the beautiful nature of the country. The seven members who went to Sujan Shakya’s home are: Yoo Seyoon, Alberto Mondi (Italy), Zhang Yuan(China), Daniel Lindemann(Germany), James Hooper(England) and Mark Tetto(USA). Fans expectations are rising since a new member from USA and the hidden member James participated in the show. In the first poster, Nepal’s Mother Nature is on the background and people can plentifully enjoy its exotic mood. The members have ‘TIKA’ on their forehead, which means ‘Bless’ in Nepal’s traditional ritual. 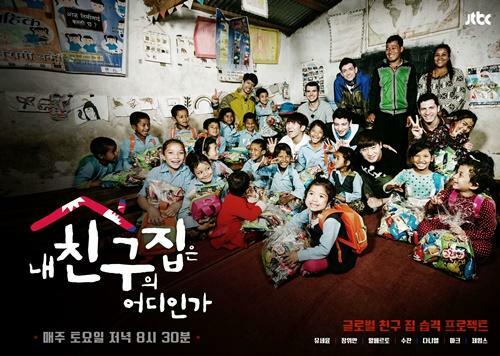 In the other poster, the seven members are in an elementary school in Kodari, one of the best vacation spots in Nepal. They are surrounded by Nepalese children and this image is quite heartwarming. The third destination of JTBC ‘Where Is My Friend’s Home’ is Nepal which has 8 of the highest mountains in the world and more than 50 mountaintops over 7,650m. The country is well-known for its wonderful nature and as the ideal place to go backpacking.